Nowadays, there’s no such thing as a quiet month on Netflix, but this March is shaping up to be an especially exciting time to be a subscriber to the ubiquitous streaming service. Netflix is adding an insane amount of must-see movies and TV shows next month, and you’ll find them all right here. Feel free to take in our breakdown of the highlights or just skip straight to the list. The fun begins with the feature films incoming next month, as Netflix is adding some absolute humdingers. Chief among them are Martin Scorsese’s epic 1995 crime drama Casino, featuring all-time performances from Robert De Niro, Sharon Stone and Joe Pesci; sweet and eminently quotable romantic comedy Forgetting Sarah Marshall, highlighted by a career-launching turn from charismatic funnyman Jason Segel; and cult 2001 summer-camp comedy Wet Hot American Summer, which has since spawned numerous new Netflix iterations—all of the above debut on March 1. Also appearing on Netflix on the first of next month are Zack Snyder’s hyper-stylized ancient war film 300, boozy Broken Lizard comedy Beerfest, sexed-up teen tale Cruel Intentions, iconic paranormal comedies Ghostbusters (though it’s unclear whether that refers to the 1984 original or the middling 2016 reboot) and Ghostbusters 2, Duncan Jones’ compelling debut feature Moon, Sam Mendes’ Oscar-nominated Revolutionary Road adaptation and Jason Reitman’s acclaimed 2009 romantic dramedy Up in the Air, among others. Following those later in March are several notable Netflix originals, including French-Canadian zombie apocalypse drama Les Affamés (March 2), Jared Leto-starring crime epic The Outsider (March 9), the streamer’s reboot of beloved family film Benji (March 16) and acclaimed hip-hop biopic Roxanne Roxanne (March 23), to name a few. And for the comedy fans among you, there’s a huge special on the way next month: Ricky Gervais: Humanity, debuting on March 13. The U.K. comedy titan’s new stand-up special is his first in seven years, and it’s one you won’t want to miss. Netflix’s TV slate for the month is just as impressive as its films, if not more so. Leading the way is none other than Marvel’s Jessica Jones, returning for a second season on March 8. 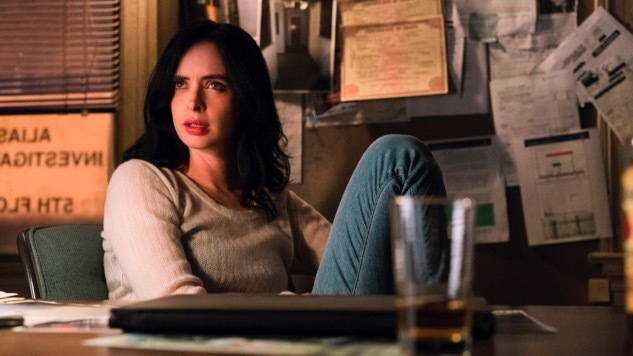 Last year, we ranked the Krysten Ritter-starring series among Netflix’s very best original shows, so you can bet we’re excited to see its sophomore installment, all 13 episodes of which will be directed by women, as is only right, especially considering that the show debuts on International Women’s Day. That much-anticipated return of Jessica Jones is just one of many big additions Netflix is making in March: It’s preceded by the March 4 debut of The Joel McHale Show with Joel McHale—aka The Soup 2.0, in which the charismatic McHale “takes a sharp, absurdist look at pop culture and news from across the globe” in what Netflix calls a “fast and funny distillation of everything people are talking about that week”—and it’s followed by the third season of Judd Apatow comedy Love, the latest episode of My Next Guest Needs No Introduction With David Letterman—featuring Pakistani activist and Nobel Prize laureate Malala Yousafzai—and Carey Mulligan-starring limited series Collateral, all debuting on March 9. Later in the month, Netflix debuts the first season of POC-led coming-of-age comedy On My Block (March 16), the second season of dark cannibal comedy Santa Clarita Diet (March 23) and the second season of its adaptation of A Series of Unfortunate Events (March 30), which Neil Patrick Harris (as Count Olaf) promises will be “quite dreadful”—far worse than the first. Count us in, Count. We end, as always, on a bittersweet note: detailing the programming leaving Netflix next month. Fortunately, not all that much is leaving the service in March, but there are several essential titles on this list, so act accordingly in the coming days. Departing on March 1 are early-’90s animated classic FernGully: The Last Rainforest, one of the very best films on Netflix—if not the best films ever made—in Steven Spielberg’s Jaws, and Christopher Nolan’s mind-bending breakthrough film Memento. Following later in the month are seasons one and two of AMC’s acclaimed crime drama The Killing on March 13, seasons one through seven of FX’s beloved spy comedy Archer on March 14, animated Oscar winner Zootopia on March 20, the innovative and Oscar-winning animation/live-action hybrid Who Framed Roger Rabbit on March 24, and Wes Anderson’s 2004 Bill Murray starrer The Life Aquatic with Steve Zissou on March 26. Get to it, streamers. See everything Netflix is gaining and losing in March below, beneath their sizzle reel.